It’s Friday! Mega Swagbucks Day? It’s Friday! You all know what that means by now, right? It’s Mega Swagbucks Day! When you search the web using the Swagbucks search engine, you can earn 100, 200, even 1000 Swagbucks. Swagbucks can be earned and redeemed for great prizes and gift cards! I’ve been collecting Swagbucks all year. You might just see some of those prizes and gift cards in our giveaways throughout the year! Head over to Swagbucks and sign up for free to start earning gift cards from Gap, Amazon, CVS and more! Who doesn’t want to get paid for searching the web when they do it anyway? It’s Friday! That means It’s Mega Swagbucks Day! When you search the web using the Swagbucks search engine, you can earn 100, 200, even 1000 Swagbucks. Swagbucks can be earned and redeemed for great prizes and gift cards! Now through 12/31, new members to Swagbucks can start off with 130 points just for signing up! Head over to Swagbucks.com here and enter the code HOLIDAYSWAG for 100 points. You’ll also receive the regular 30 points that all new users get, that’s 130 points! Mega Swagbucks Friday! Sign up and start earning! Mega Swagbucks Friday! Have you signed up yet? Yay! It’s Friday, which means it’s Mega Swagbucks Day! When you search the web using the Swagbucks search engine, you can earn 100, 200, even 1000 Swagbucks. Swagbucks can be earned and redeemed for great prizes and gift cards! I’ve been collecting Swagbucks all year. You might just see some of those prizes and gift cards in our giveaways! Head over to Swagbucks and sign up for free. Itâ€™s Friday and Mega Swagbucks Day! Every Friday which means it’s Mega Swagbucks Day! When you search the web using the Swagbucks search engine, you can earn 100, 200, even 1000 Swagbucks. Swagbucks can be earned and redeemed for great prizes and gift cards! I’ve been collecting Swagbucks all year. You might just see some of those prizes and gift cards in our giveaways this year! Head over to Swagbucks and sign up for free. Who doesn’t want to get paid for searching the web? Every Friday is Mega Swagbucks Day, which makes Friday even better! What does that mean for you? That means searching the web became a lot more fun. When you search the web on Mega Swagbucks Day, you can earn 100, 200, even 1000 Swag Bucks just for searching using the Swagbucks search box. It’s just like other search engines, you might as well get paid to do it! To get your Swagbucks started, use coupon code AUGUSTBONUS to get 50 bucks PLUS the regular 30 sign up Swagbucks for a total of 80 Swagbucks for new members! Remember all the giveaways I did around the holidays last year? I used Swagbucks to get those awesome Amazon.com gift cards! Now they’ve added even more options. I can’t wait to see what we’ll be giving away this year! Head over to Swagbuck and sign up. It’s free and easy to use. You still have a few more months to start earning points for prizes! It’s Friday! Mega Swagbucks Day is here. I love Swagbucks! Every Friday is Mega Swagbucks Day, which makes Friday even better! What does that mean for you? That means searching the web became a lot more fun. When you search the web on Mega Swagbucks Day, you can earn 100, 200, even 1000 Swag Bucks just for searching using the Swagbucks search box. It’s just like other search engines, you might as well get paid to do it! Mega Swagbucks Friday! Have you started earning yet? You all know how much I love Swagbucks! Every Friday is Mega Swagbucks Day, which is great for us! That means searching the web became a lot more fun. When you search the web on Mega Swagbucks day, you can earn 100, 200, even 1000 Swag Bucks just for searching using the Swagbucks search box. It’s just like other search engines, you might as well get paid to do it! Happy Birthday to me! I was amazed at how many birthday offers were in my inbox today. 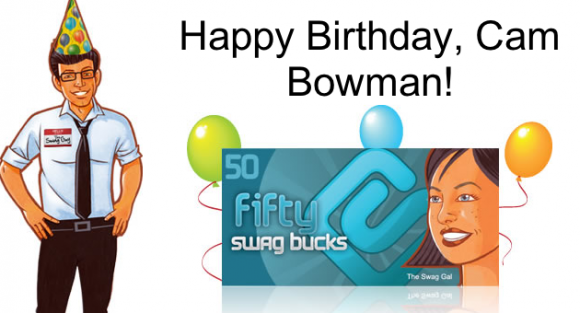 One of the best emails today was 50 Birthday Swagbucks! Plus I can get breakfast, lunch, dinner and ice cream for free today! Sign up now for these great birthday treats! BASKIN ROBBINS Join the birthday club and you’ll get 1 FREE Scoop on your birthday! BD’S MONGOLIAN BARBACUE: Join Club Mango and you’ll receive a FREE Stir Fry on your birthday! Did someone say Friday? Mega Swagbucks Day is here! You all know how much I love Swagbucks! Every Friday is Mega Swagbucks Day, which is great for us! That means searching the web became a lot more fun. When you search the web on Mega Swagbucks day, you can earn 100, 200, even 1000 Swag Bucks just for searching using the Swagbucks search box.